DSSSB 2019 will be conducted to recruit eligible candidates to the multiple posts offered by Delhi Subordinate Service Selection Board. The Posts to which the recruitment is made are for: Assistant Engineers, Junior Engineers, Lab Assistant, Probabtion Officer etc. A lot of vacancy has been declared by DSSSB for multiple posts for which the recruitment is to be done. In its latest notification released for the post of Junior Engineer, Stenographer, Lab Assistant, Assistant Engineer etc, a total of 204 vacancies has been declared for the Grade B & C Posts and around 264 vacancies for the post of Assistant Engineers & Junior Engineers. Candidates can have a look at the detailed vacancy by clicking from the table below. DSSSB Exam for the post of Junior Engineers, Group B & C Posts have not been released yet. Let's have a look at the detailed Exam Dates for DSSSB 2019 announced so far. The details for DSSSB 2019 Exam will be released soon. Keep visiting the page to remain updated about the upcoming DSSSB 2019 Exam Dates. As per latest notice released by Delhi Subordinate Service Selection Board, the Online Application for the post of Assistant & Junior Engineers started from 30th January 2019 and will end on 1st March 2019. The Online Application for the post of Group B & C Posts started from 31st January 2019 and wille nd on 5th March 2019. Candidates can apply online for the same by clicking on the link mentioned below. The Eligibility Criteria of the candidate differs according to the posts offered through DSSSB 2019. 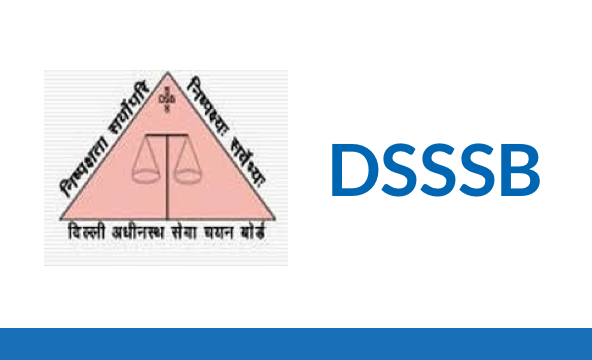 Let’s have a look at the Eligibility Criteria of Candidates applying for multiple posts through DSSSB 2019. Speed or 80 w.p.m in shorthand and 35 w.p.m. typewriting in Hindi. 09/19 Stenographer Gr.-II 12th pass or equivalent qualification from a recognized Board or university. 03 years Diploma in Engineering in Environment / Civil from a recognized Board/University or Institution Not exceeding 30 years 3 years experience in pollution control activity/sewerage works is required in case of Diploma. DSSSB Admit Card will be issued to candidates separately for different posts offered. Candidates will be able to download the Call Letter soon from the link that will be activated soon once it has been released by Delhi Subordinate Service Selection Board. DSSSB Results will be declared after the examination of DSSSB is conducted. The final list will be prepared in descending order of the marks obtained by each candidate in DSSSB 2019 Exam. The cut off for DSSB 2019 keeps on changing every year. It depends upon the number and quality of questions being asked in the examination. The cut-off for Tier-I and Tier-II are likely to be different.